Today is Every Inchie Monday and the word is frolic. 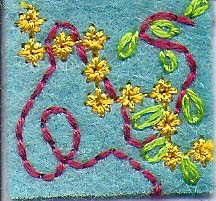 I decided that I would most like to frolic in a garden so I used my machine embroidery stitches and embroidered the yellow flowers, then I added the purplish red line which is the line of the frolicker and some green leaves. The leaves and frolicking line are done by hand. Once again I started with a larger piece of fabric and cut it down to size. 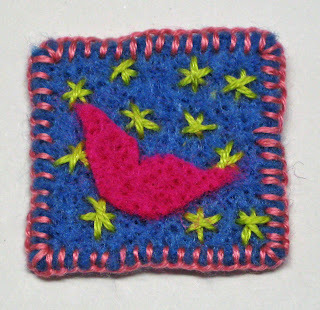 To see more inchies go to Every Inchie Monday. 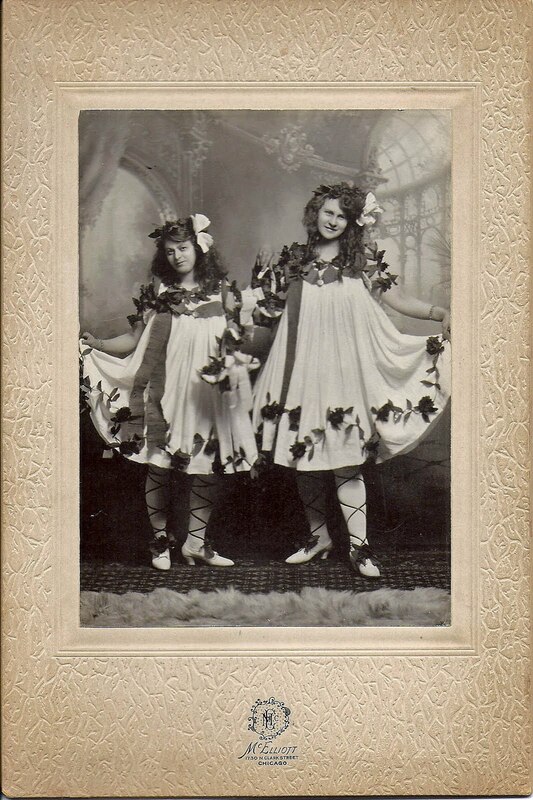 Another thing I want to share is this funny picture I found while poking through some antique shops when we were up in northern Wisconsin. 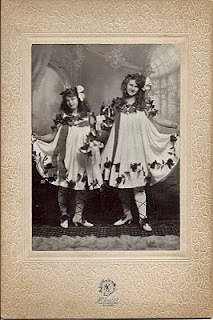 Written on the back of the photo is "Louise ready for a masquerade." I think it would be fun to print this on some fabric and do some embroidery on it. 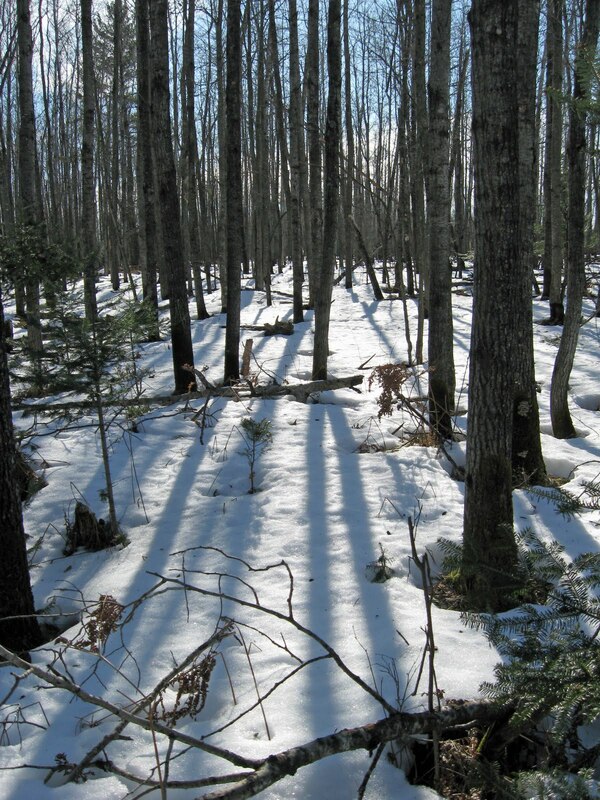 This past weekend we went to northern Wisconsin to Treehaven, an educational facility in the woods. My husband took some of his students for a class project and while he taught, I got to roam the woods, read, stitch and generally relax. I thought I would share some of my photos. 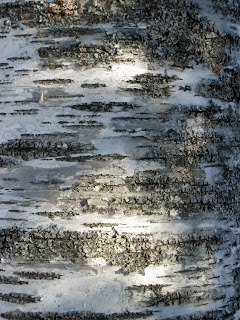 I tend to like the minutia of life so here are my shots of tree bark, tiny dried weeds and one long view of the woods. 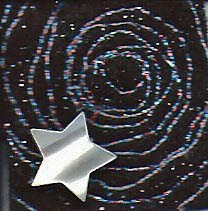 I had some black felt with glitter embedded in it which gave it a lot of depth. Once again I cut a piece larger than one inch and stitched some metallic thread in a circular motion to give it a sort of endless feel. I trimmed it down and then topped it off with a star bead. To see more of this weeks inchies go here. On another note, I have been the winner of several great door prizes from One World One Heart! How exciting that is! When I recieve them I'll give you a peek at what has come my way. 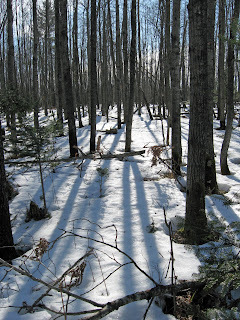 I went up to northern Wisconsin this past weekend with my husband and have some fun pictures of the wintery outdoors, I'll post them later in the week. 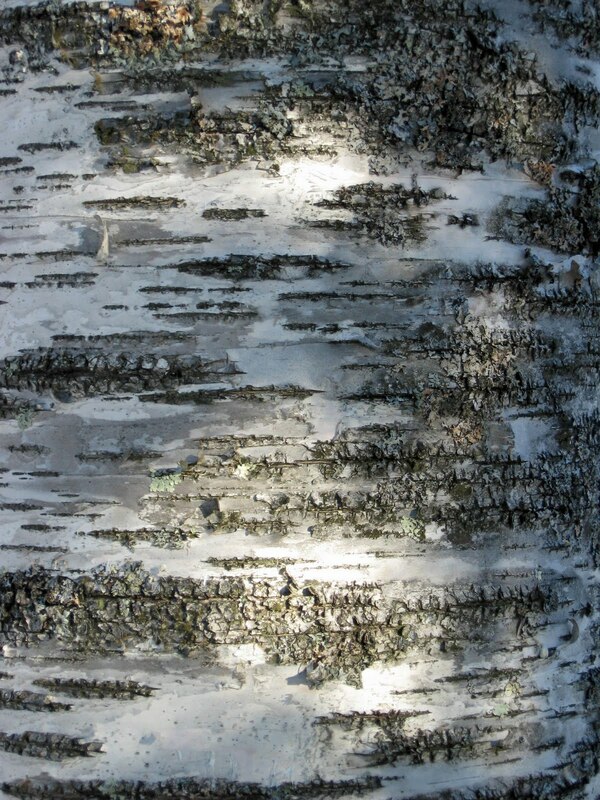 Now, I have to take my dog for a walk in the continuously falling snow and get some nice hot soup simmering for dinner. One World One Heart is over and what an amazing event it was. 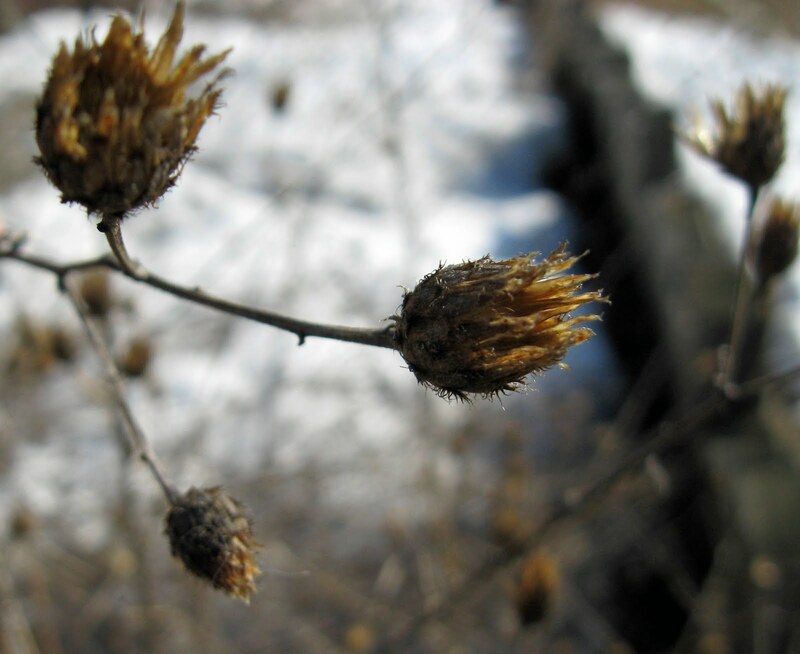 I found so many great blogs, followed many of them and bookmarked others. 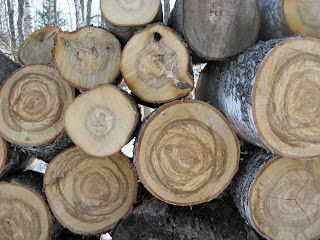 When I opened Google Reader this morning there were over 300 posts to read. I really don't think I'll get to all of them, I'll certainly read my old favorites and maybe start from scratch on the new ones. Well, for the winners. They are Marie at Spun by Me, Jo at Tanglefrost and Debra of It's All Good. Congratulations, I've e-mailed all of you so please send me your addresses. Well I am a bit behind with my inchie, but I did it and want to post it. The theme was fishy and the day was Valentine's, so again I combined the two and came up with some love-ly fishies. To see more inchies go here. 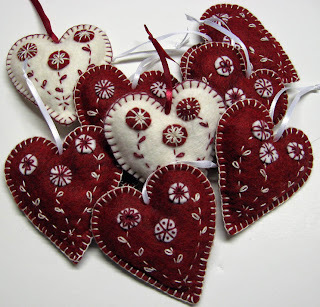 There are just a few more days left of One World One Heart and if you are looking for my post scroll down a bit or click here. 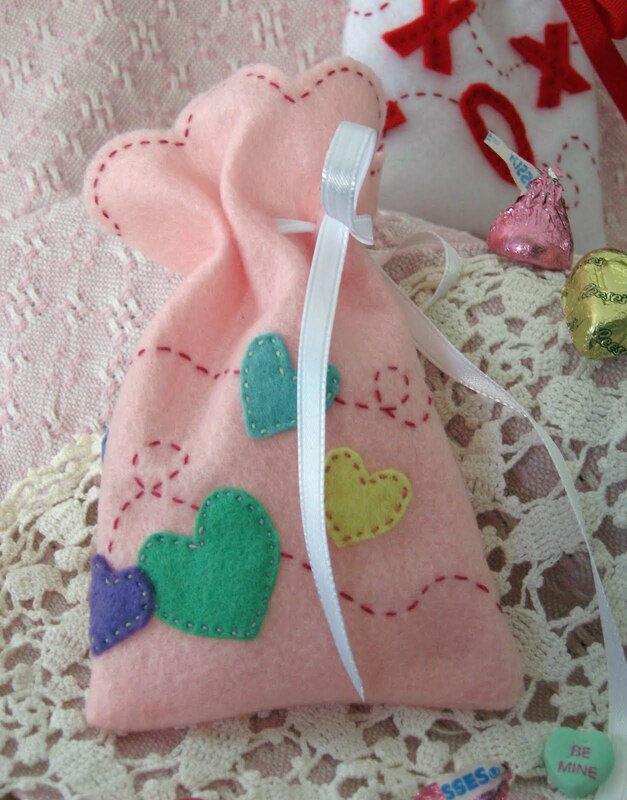 As promised, here is a tutorial for these cute Valentine Treat Bags. 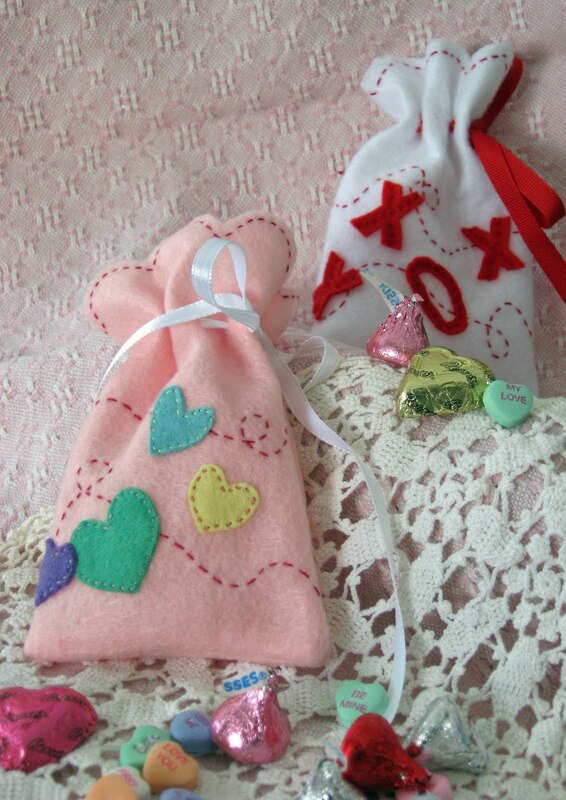 Fill these with some sweet candy or little gifts and you'll be well loved! Both bags are made exactly the same way just cut x's and o's instead of hearts for the white one. Have fun! 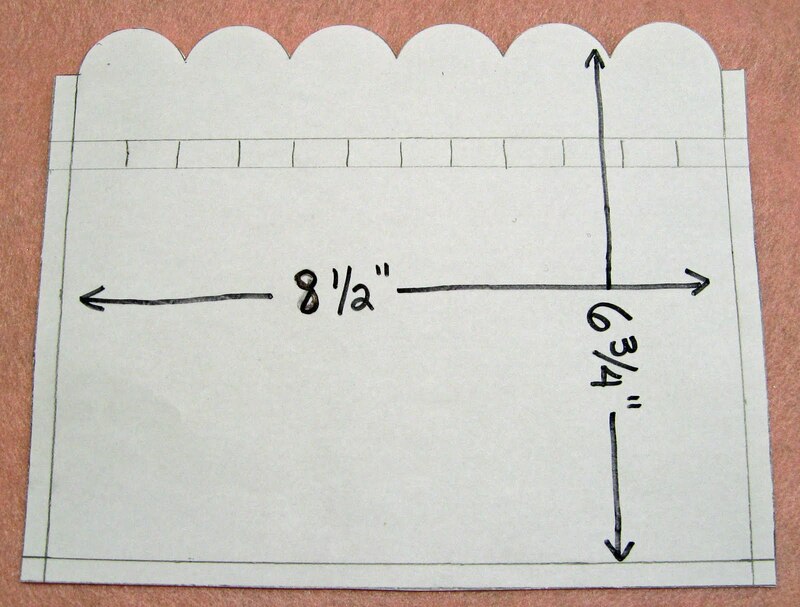 To make the pattern cut a rectangle 8 1/2 by 6 3/4 inches. 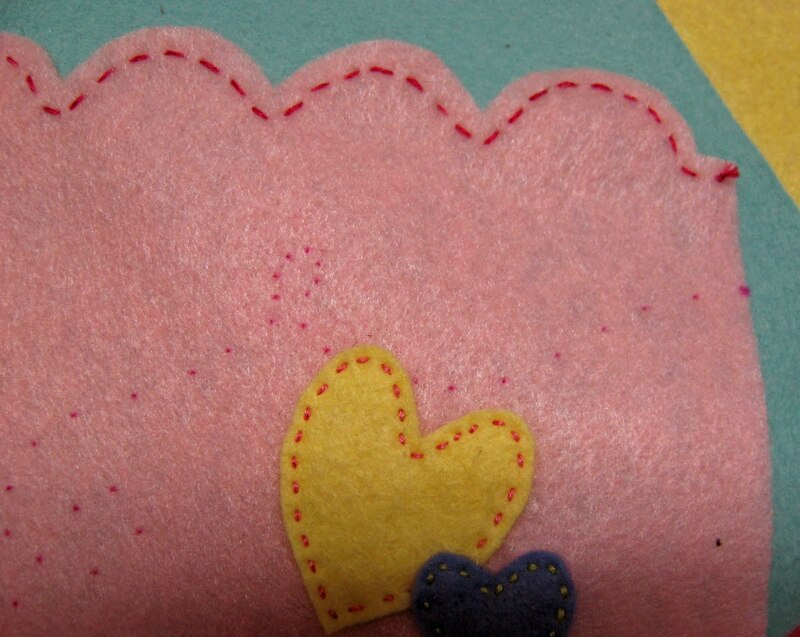 To mark the line for the ribbon cuts measure an inch and a half from the top draw a line from side to side. 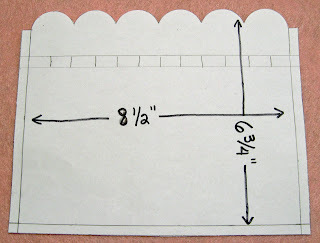 Draw another one parallel and 3/8" below the first one. Mark 1/4" seam allowances on the bottom and two sides. 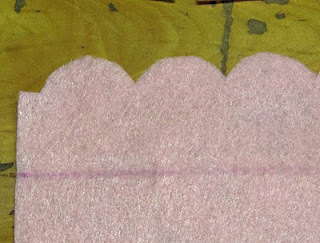 Using a scalloped ruler, or just eyeball it, draw scallops along the top. Please look at the image if any of this seems confusing. 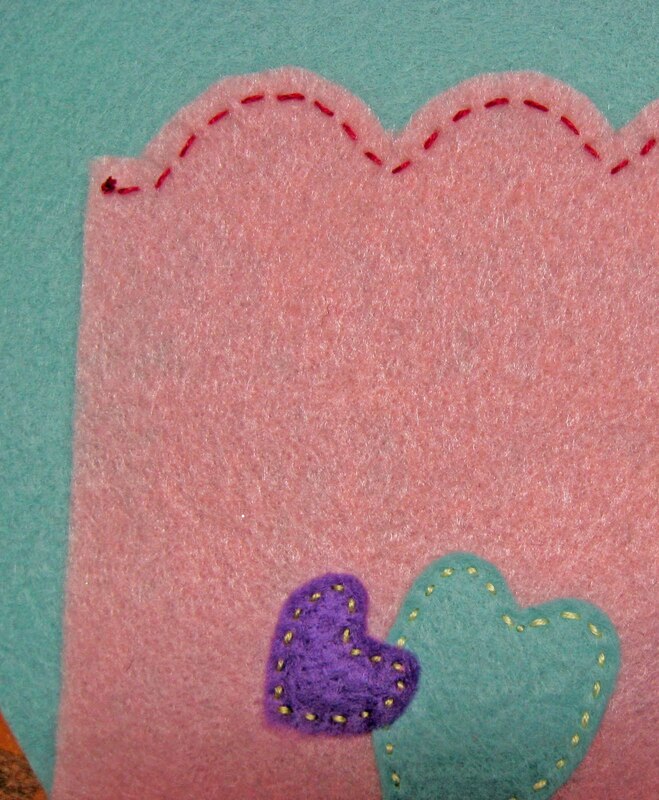 Pin the pattern onto the felt and cut out. 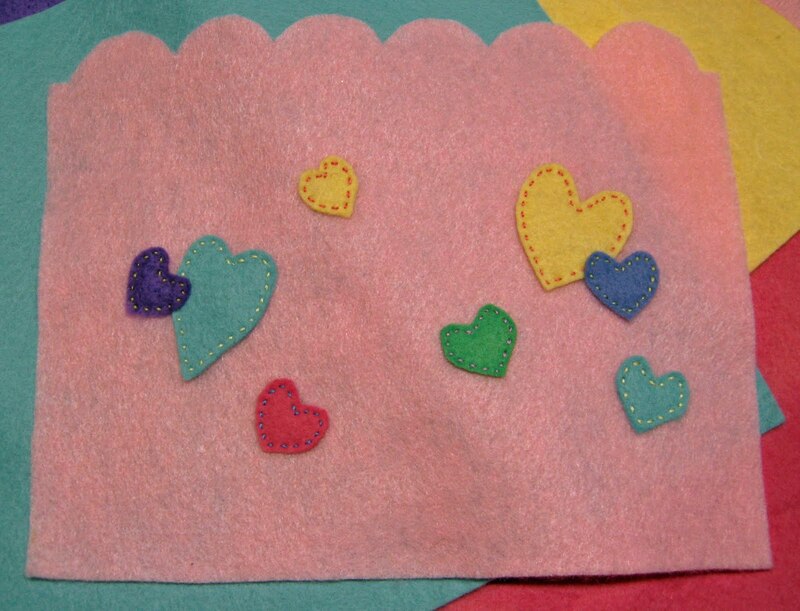 Fold back the pattern on the lower line that was drawn for the ribbon. 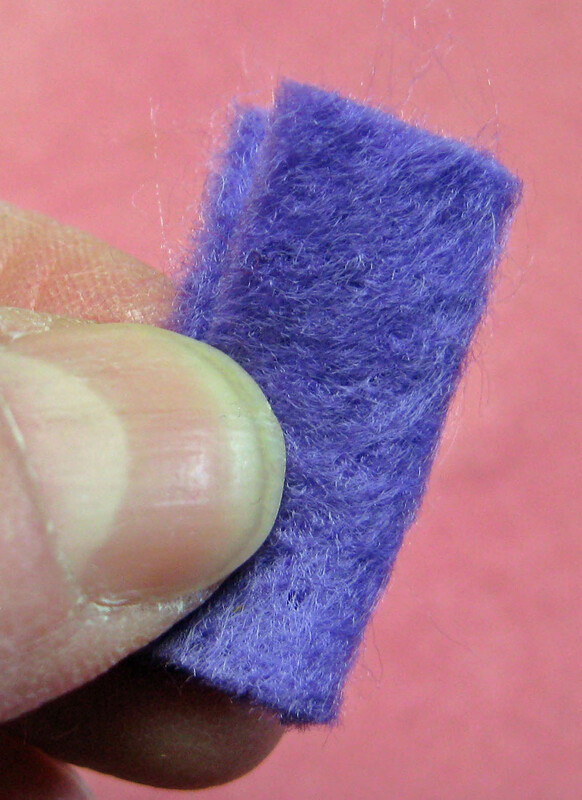 Mark this line on the felt with a purple disappearing pen. 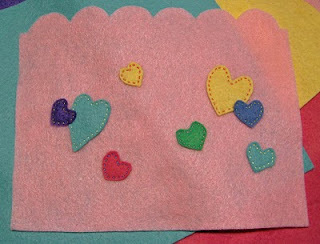 Next cut out hearts, just like you did in elementary school. Cut a square or rectangle, fold it in half and cut half a heart, open and viola! 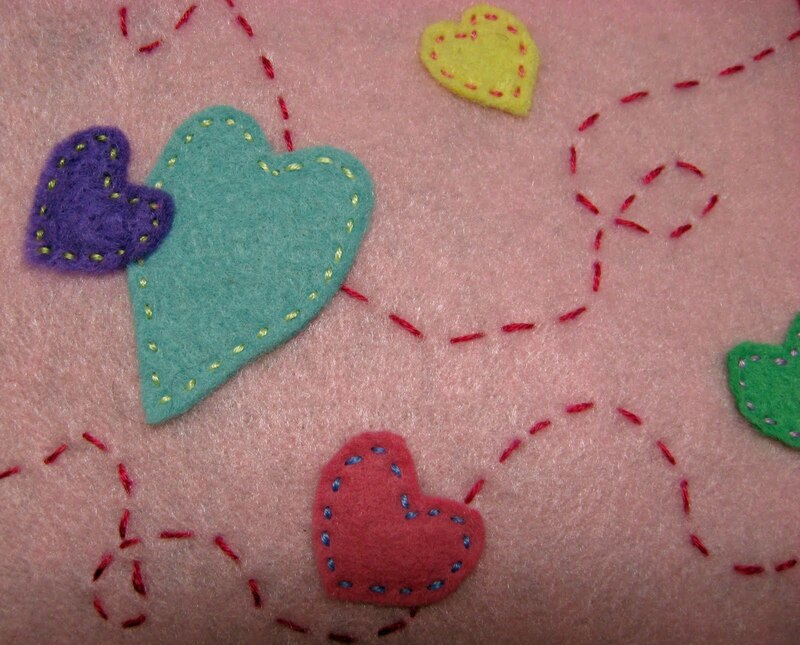 Arrange the hearts in a way that makes you happy. Be sure to stay underneath the line for the ribbon. Using three strands of embroidery floss and using a running stitch, stitch down the hearts. 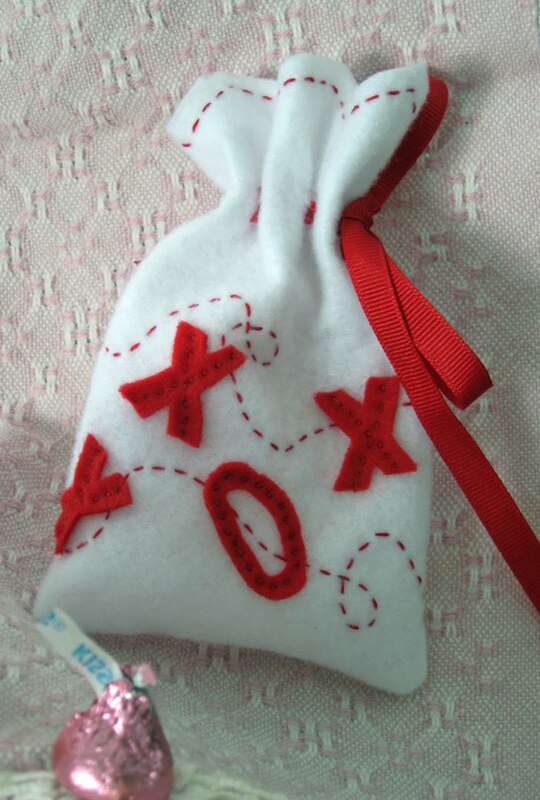 Bury the knot under the heart so it wont be on the inside of the bag, but between the bag and the heart. 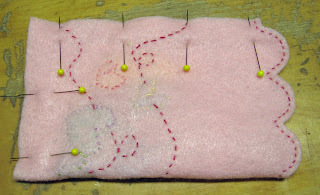 Using the purple pen, make dots for the meandering stitch lines (I did two). Once again, keep this below the line for the ribbon. 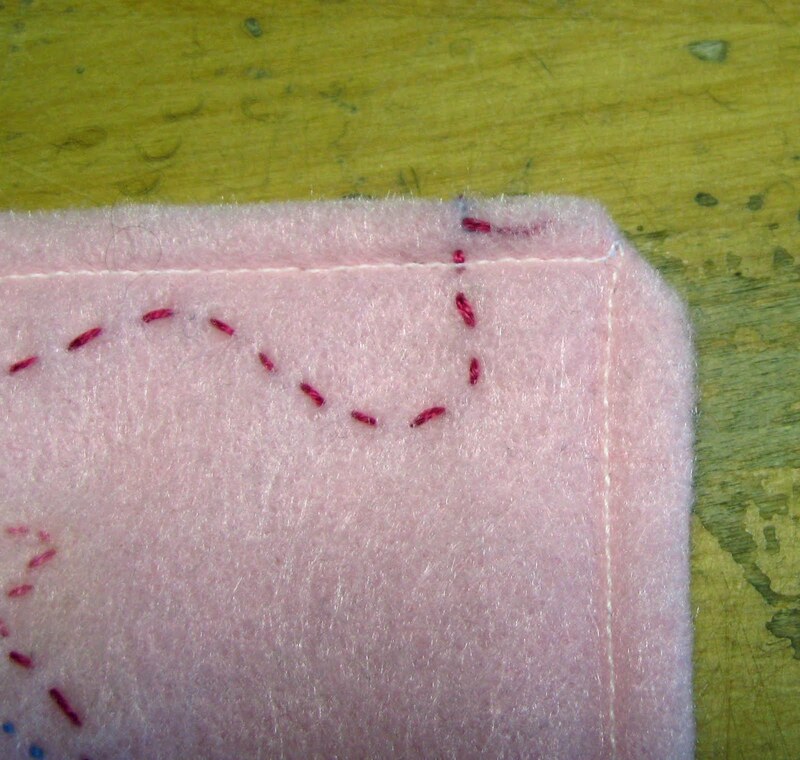 To have the stitching lines meet up after sewing, mark on the side you will end the stitching on, where you started. That way you can end your line in about the same place you started. 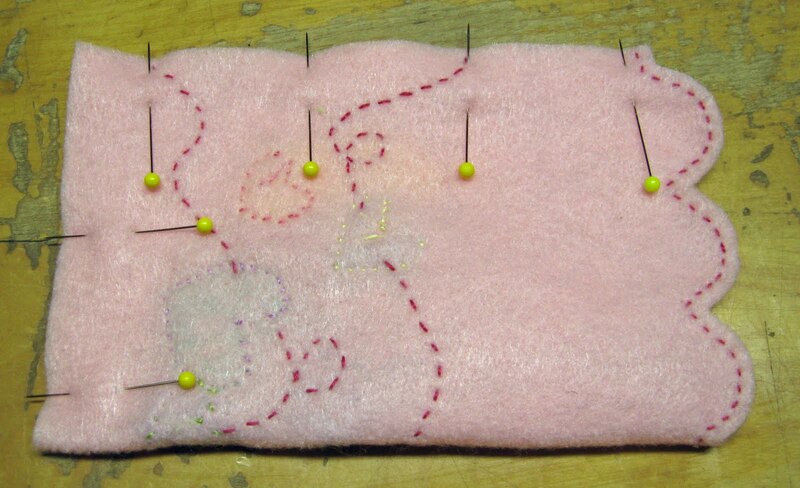 Stitch the meandering line. 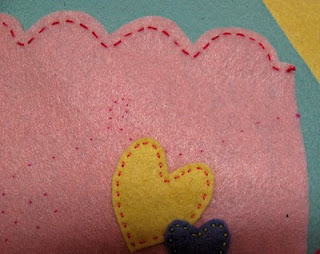 Stitch 1/4" away from the scalloped edge. With sharp pointed scissors make small cuts about 1/4" long for threading ribbon through. The cuts should be about 1/2" apart. Fold bag in half matching sides, and using a sewing machine, stitch a 1/4" seam allowance across the bottom and up the side. Trim the corner on a diagonal. Turn bag right side out. 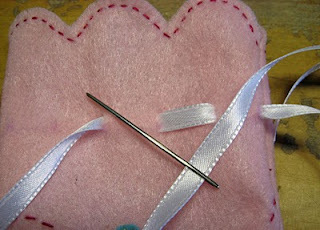 Using a large eyed tapestry needle, starting next to the seam, thread the ribbon through the small cuts. Make sure you straighten out the ribbon after each stitch because it tends to get twisted. Fill with treats! 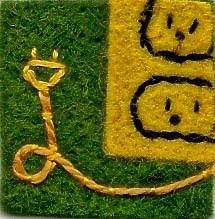 Every Inchie Monday again and the word is electrifying. I decided to be very literal this week and I have a little electrical socket and a cord to be plugged in. 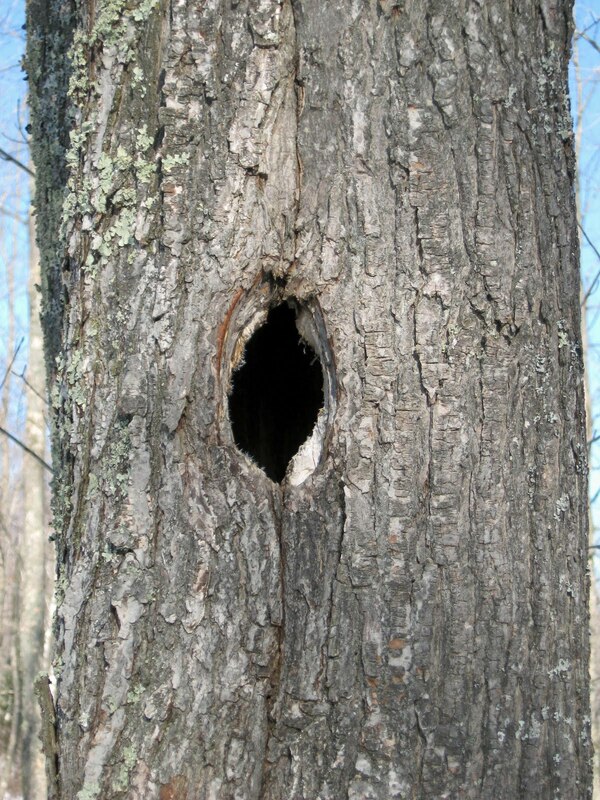 Did I ever mention I live in Wisconsin? Well, in honor of the Packers great victory yesterday my electifying homage to the Packers wears green and gold. 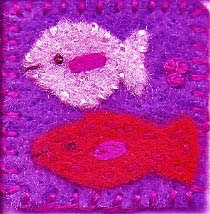 To see more inchies go visit Every Inchie Monday. If you are looking for my One World One Heart post scroll down or go here. 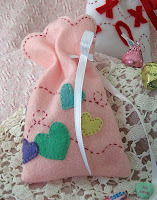 I also hope to be back later today or tomorrow with my Valentine Treat bag tutorial. 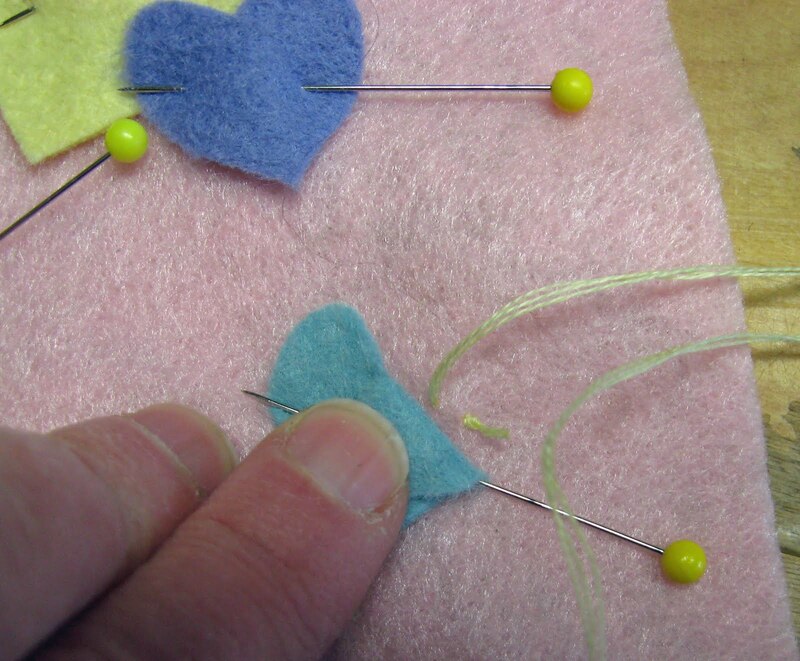 Since it is February and Valentine's Day is nearing I find myself playing with hearts. I decided to expand on the hearts I have been making and try a different design. This one is quite a bit larger and I appliqued some birds and then added the flowers and stems that were in the smaller ones. I really love how this turned out. Another thing I am working on is a little tutorial for some Valentine treat bags...that will be my next post. I still have some kinks to work out, mostly with the photos. I need to re-take some of them and that means make another bag LOL! So, stay tuned! If you are looking for my OWOH post, it is just below and features one of my small hearts! When I thought about this word what came to mind was a giant smile so I made a little felt (I seem to be obsessed with felt these days) square and embroidered some starbursts in the background, a big smile on top and finished the edges with little blanket stitches. To see more inchies go to Every Inchie Monday! On another note, Happy February! I really love this month, Valentine's Day which is also the day we got married, inspires me with happy colors and hearts galore. 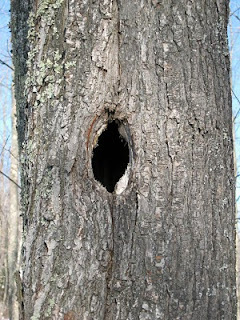 I've come up with some projects, recipes and fun links so come back and visit often! 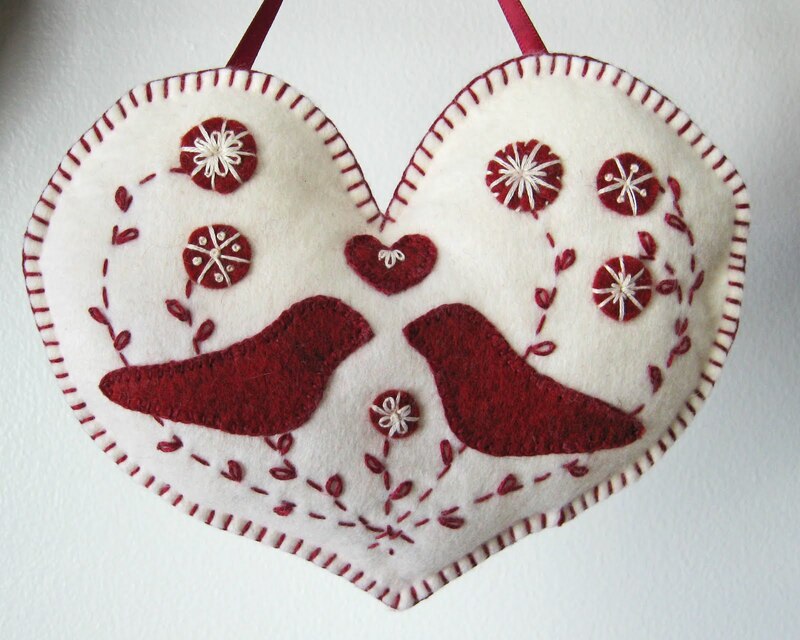 If you'd like to win one of my felt embroidered hearts join in on the One World One Heart giveaway in the post just below this one!